Remarkable exterior design, the most-wanted destinations and beautifully styled interiors — that’s often all it takes to turn a mansion from ordinary to extraordinary. From a “wow”-worthy Miami contemporary with breath-stealing city and water panoramas to a celebrity dream villa in Beverly Hills, the Coldwell Banker Global Luxury® program rounds up the 10 of the latest and greatest properties for sale priced over $10 million that embody the true meaning of extraordinary real estate. 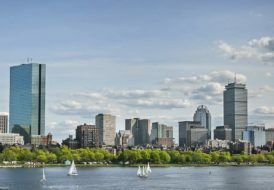 A masterful achievement of concept and design, this contemporary residence showcases exquisite craftsmanship, cutting edge design, eastern breezes and exceptional direct downtown views. 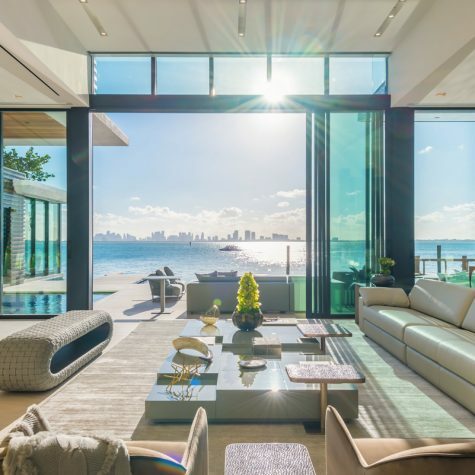 Resting on a 23,000 square feet and featuring 140 feet of waterfront and views stretching from Biscayne bay to Downtown Miami, this stunning 11,000 square-foot custom home blends the best of Miami living with outdoor spaces, a zero-edge infinity pool, expansive terrace, outdoor kitchen, 400-square-foot dock, theatre, gym, guest house, meditation garden, three-car garage, 200+ bottle wine room, a sophisticated chef’s kitchen, staff kitchen, maid’s quarters, rooftop deck, mezzanine deck and a private elevator. 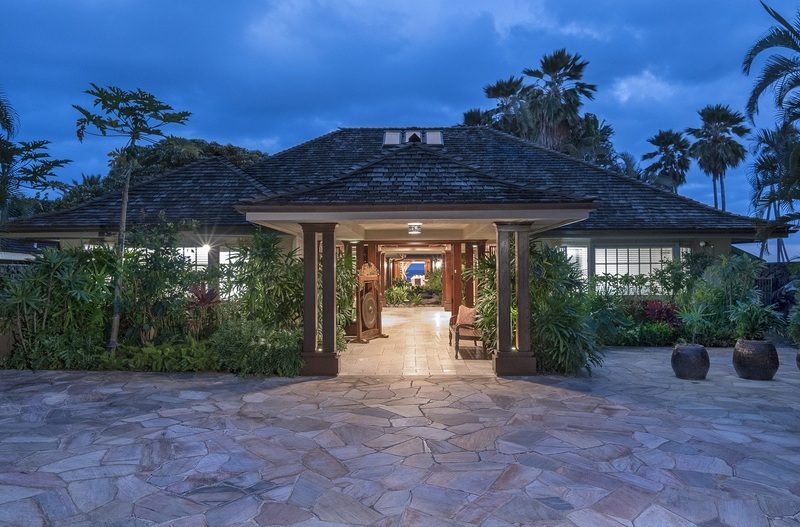 A coveted location on prestigious La Gorce Island makes this property truly a standout. Masterfully reimagined by legendary designer Windsor Smith and sited on a 1.56 acre lot rests this exquisite Neo-Georgian inspired residence in Hidden Hills, a gated community near Calabasas just 28 miles outside of Los Angeles. A grand double staircase foyer with honed marble and wood accents opens into a breathtaking formal living room sheathed in a leather wall covering and anchored by an oversized stone fireplace. An expansive double island Chef’s kitchen is complete with breakfast nook, walk in butlers pantry with sink, additional walk in pantry with wine refrigeration, Wolf appliances, & custom cabinetry. A screening room reminiscent of Old Hollywood affords the latest in technology. The master suite is a true sanctuary with an office, boutique style closet and sumptuous bath quarters with heated floor, a luxurious tub, & spacious shower. Meticulously landscaped grounds complete this superb property and offer several entertaining enclaves, sports court, outdoor kitchenette, barn with arena and a dramatic zero edge pool. 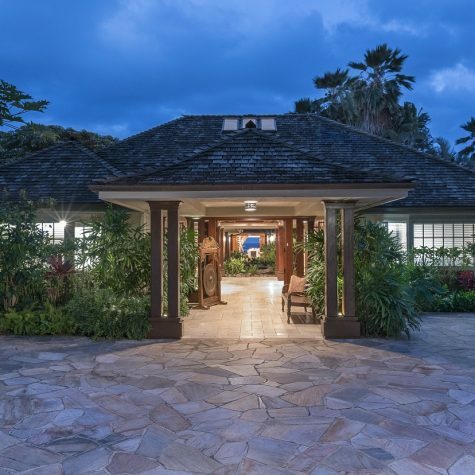 This elegant, gracious oceanfront estate property represents one of the best values on famed Kahala Avenue, one of Honolulu’s most prestigious addresses. A dramatic entry courtyard with a free form sculptural garden, fishpond and waterfall sets the stage for a relaxing indoor/outdoor island style featuring custom reclaimed hardwood floors, high ceilings, six spacious ensuite bedrooms, and beautifully landscaped grounds surrounding a pool, spa, waterfall — all designed to embrace the ocean. 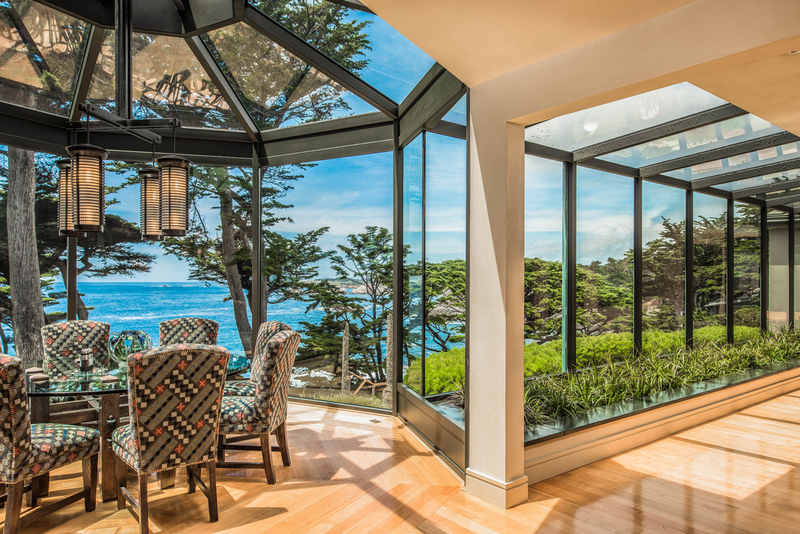 As featured in Architectural Digest and the movie Basic Instinct, this California Modern masterpiece estate meets the Pacific Coast at dramatic Wildcat Cove just minutes from Carmel. On two amazing oceanfront acres stands one of the most stunning homes on the West coast. This 16-room, 12,000-square-foot residence with views of iconic Point Lobos features five bedroom suites, with seven full and two half baths, copper and glass roof, breathtaking ocean views, two amazing kitchens, a must-see two-story domed library, a party floor with 2nd kitchen and Delfield Soda Fountain, plus so much more. The home is surrounded by over two acres of masterfully thought-out landscaping that blends the hand-of-man with the stunning natural surroundings which include winding stone paths, numerous stone seating areas and several water features. 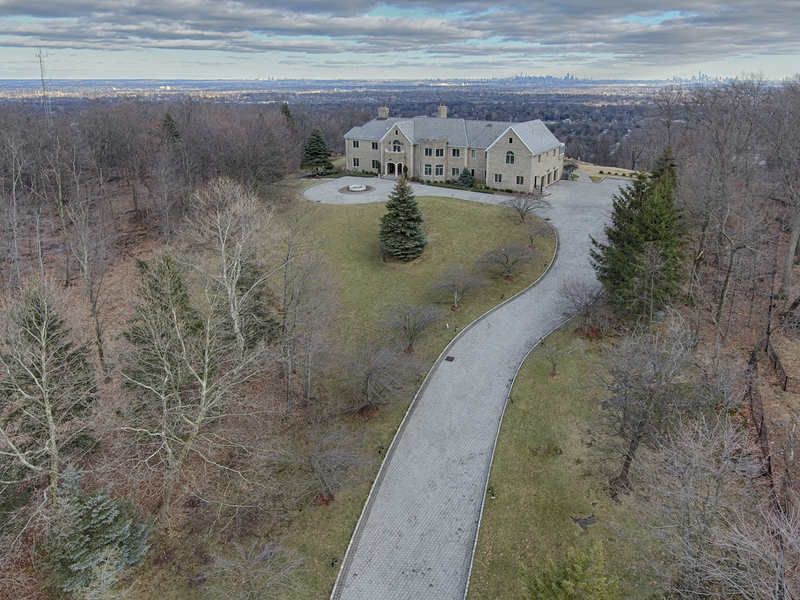 This landmark home will amaze all who see it and be a world-class treasure to own. Resting on a spectacular, double point “trophy” lot, this Palm Beach-inspired mansion in Boca Raton offers over 473 feet of grand canal frontage in Royal Palm Yacht and Country Club. The home was built by the famed Mark Timothy Pulte and has every imaginable amenity. Features include: health spa, movie theater, chefs kitchen, billiards room and cigar lounge, indoor and outdoor pools, 5 car garage with motor court, whole home generator, putting green, grand formal dining room with butlers pantry, wine cellar, elevator, two large offices, boat house and much more. A stately brick Colonial nestled in Cedar Grove impresses with eight magnificent bedrooms, nine full baths, two partial baths and a three-garage. A balance of formal living and entertaining spaces blend with intimate spaces. Large picture windows reveal breathtaking views. This brand-new Paul McClean-designed architectural estate in L.A.’s Bird Streets represents years of planning and construction. 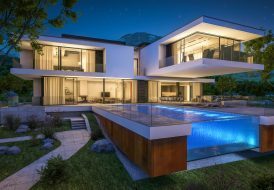 The grand contemporary exudes an aura of calm sophistication and warm modernism with the highest quality finishes including beautiful limestone floors, stunning wood-paneled 12 foot ceilings, and a 70-foot book-matched marble exterior wall for privacy. A dazzling water feature graces the entrance and leads to the first split-level swimming pool in all of the Bird Streets. The spectacular master suite is comparable to the finest hotels in the world with an incredible walk-in closet and opulent master bath. The lower level is free flowing with large entertaining spaces, a custom bar, and an intimate cigar lounge. The custom designed gym with a full steam/sauna room, an epic suede-lined screening room with seating for 18, and a “car museum” that can display 10 vehicles completes this rare offering. A celebrity dream villa nestled on one of the finest and most prestigious streets in Beverly Hills, this newly renovated compound features five bedroom suites including two master suites, and a separate guest house, an opulent floating staircase, family rooms, screening room, office, library, grand walk-in wine cellar complete with a wine tasting table, gym, billiard room, six full bathrooms, and three powder rooms. 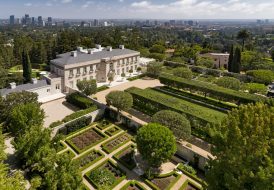 Stately rooms lead to large terraces that create a reverential connection to the minimalist designed grounds and rolling hills beyond with city views. 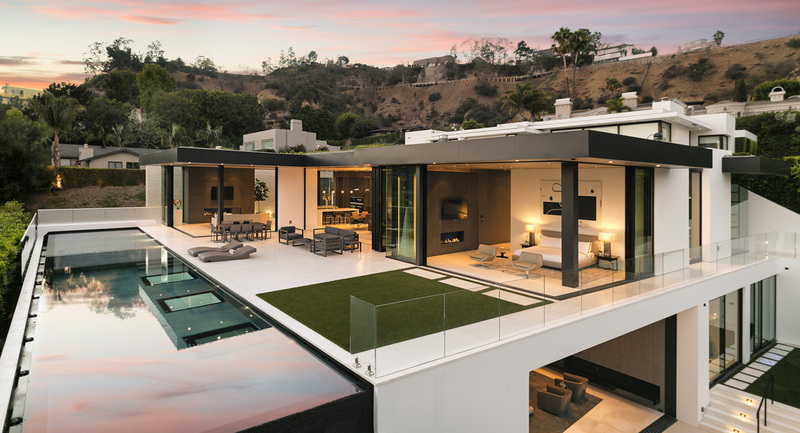 Enjoy the Beverly Hills lifestyle at its finest. Situated on a prime block in the Beverly Hills Flat and set behind a gated motorcourt, this exquisite Italian-style estate spans approximately 8,700 square feet on an approximately 19,267-square-foot lot. Extensively remodeled and in pristine condition, the residence exudes warmth, charm and quality at every turn. A seamless five-bedroom floorplan has been thoughtfully designed for family lifestyles and elegant California-style entertaining. 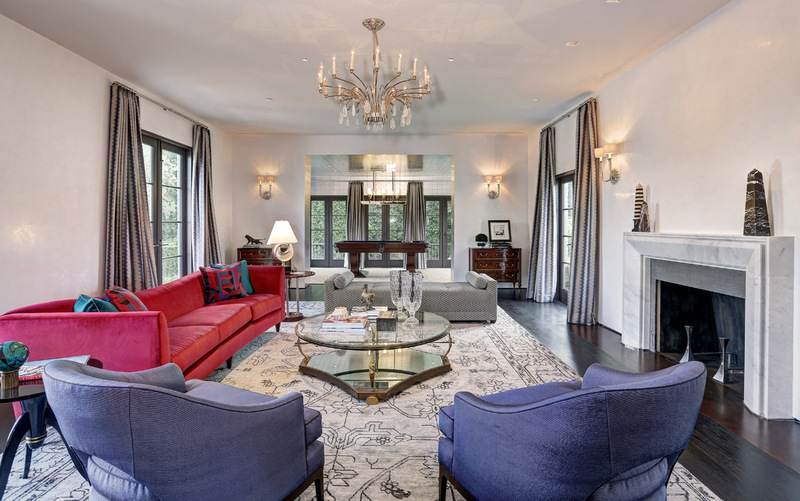 Impressive and grand, the living room offers a dramatic setting for large-scaled media watching and features an 18th century-style fireplace, open beamed ceilings and stunning wet bar. Other touches include a custom wine room, gorgeous walnut hardwood floors.large family room and a huge, professional, showroom-quality chef’s kitchen. Serene and spacious, the master retreat includes two luxurious baths, a sitting room, gym and office. A downstairs junior master bedroom is ideal for guests or those needing a full-sized first floor suite. A resort-like backyard invites private relaxation and recreation with a 40-foot swimmer’s pool, spa, expansive grassy lawn, BBQ and large patios for outdoor dining. 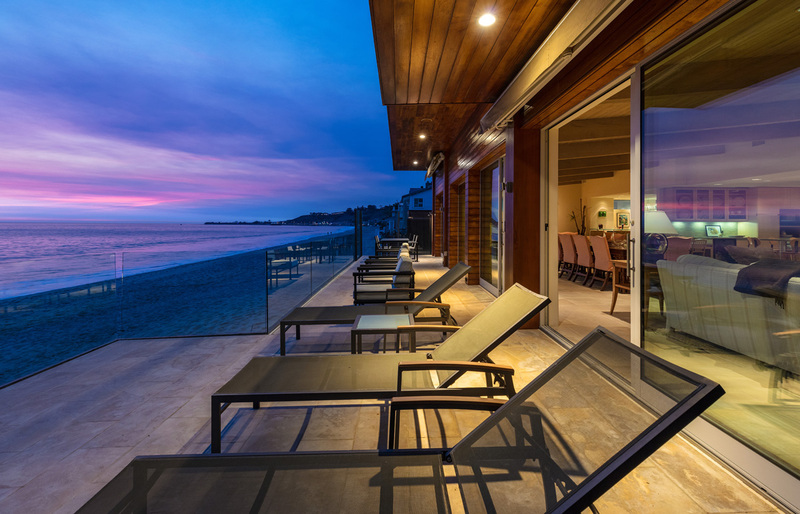 Located on one of the most exclusive enclaves in the world, this two-story Carbon Beach home, with 60 feet of sandy beach frontage, offers the ultimate Malibu lifestyle. Private and gated with a beautiful landscaped courtyard entry, BBQ island and access to the sandy beach, the main level includes an ocean view, high wood ceiling great room with fireplace living room, dining area, additional sitting room with custom bar and a gourmet island kitchen, all with ocean views through walls of glass sliders that open to an expansive entertaining/viewing deck with outdoor shower and spectacular Catalina, whitewater and panoramic coastline views. 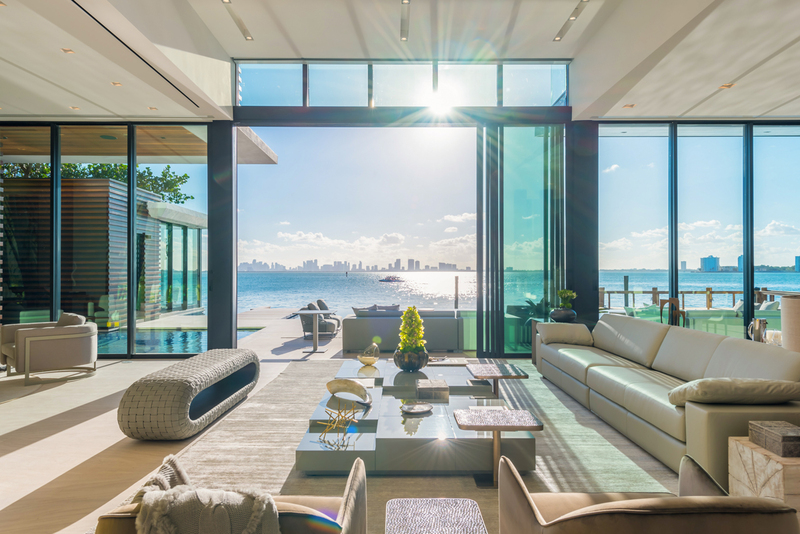 The entire second floor, with skylight landing, offers a generous sun-filled master retreat with high wood ceilings, separate sitting area or gym and a luxurious bath with spa tub, glass shower & endless ocean views. There are three en-suite bedrooms on the main level, detached garage and guest parking. 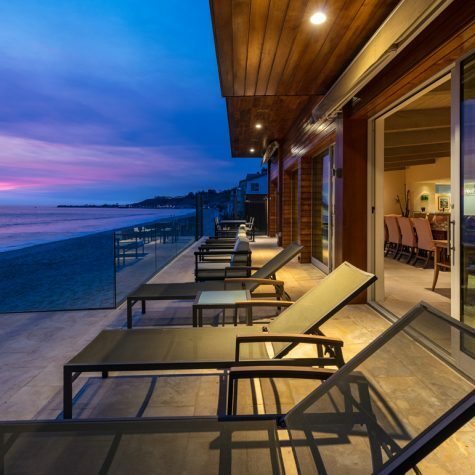 Close to restaurants, shops, organic grocery and downtown Malibu.